Every year in mid-summer, Lord Jagannath, with his elder brother Balabhadra and sister Subhadra, goes on vacation, traveling on grand chariots, from his temple in Puri to his garden palace in the countryside. This belief of the Hindus has given rise to one of the biggest religious festivals in India — the Rath Yatra or the Chariot Festival. This is also the etymological origin of the English word 'Juggernaut'. Jagannath, believed to be an avatar of Lord Vishnu, is the Lord of Puri — the coastal town of Orissa in eastern India. Rath Yatra is of great significance to the Hindus, and especially to the people of Orissa. It is during this time that the three deities of Jagannath, Balabhadra, and Subhadra are taken out in a grand procession in specially made gigantic temple-like chariots called raths, which are pulled by thousands of devotees. History has it that when the British first observed the Rath Yatra in the 18th century, they were so amazed that they sent home shocking descriptions which gave rise to the term 'juggernaut', meaning "destructive force". 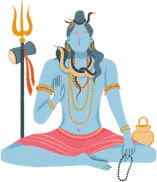 This connotation may have originated from the occasional but accidental death of some devotees under the chariot wheels caused by the crowd and commotion. The festival begins with the Ratha Prathistha or invoking ceremony in the morning, but the Ratha Tana or chariot pulling is the most exciting part of the festival, which begins in the late afternoon when the chariots of Jagannath, Balabhadra, and Subhdra start rolling. Each of these carriages have different specifications: The chariot of Lord Jagannath is called Nandighosa, has 18 wheels and is 23 cubits high; the chariot of Balabhadra, called Taladhvaja has 16 wheels and is 22 cubits high; Devadalana, the chariot of Subhadra has 14 wheels and is 21 cubits high. 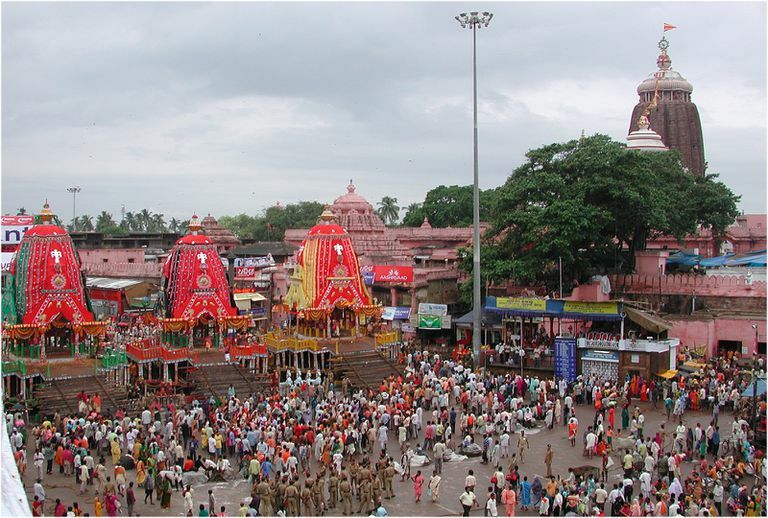 The Puri Rath Yatra is world famous for the crowd that it attracts. Puri being the abode of these three deities, the place plays host to devotees, tourists and about one million pilgrims from across India and abroad. Many artists and artisans are engaged in building these three chariots, weaving its fabric covers that dress up the chariots and painting them in the right shades and motifs to give them the best possible looks. Fourteen tailors are engaged in stitching up the covers that require almost 1,200 meters of cloth. Orissa's government-run textile mill usually supply the cloth needed to decorate the chariots. However, other Bombay-based Century Mills also donate cloth for the Rath Yatra. The Rath Yatra of Ahmedabad stands next to the Puri festival in grandeur and crowd-pulling. Nowadays, there are not just the thousands of people who participate in the Ahmedabad event, there are also communication satellites which the police use under the global positioning system to chart the course of the chariots on a map on the computer screen to monitor them from a control room. This is because Ahmedabad Rath Yatra has a bloody record. The last violent Rath Yatra which the city saw was in 1992 when the city suddenly became surcharged with communal riots. And, as you know, is a very riot-prone state! The Rath Yatra of Mahesh in the Hoogly district of West Bengal is also of historical repute. This is not only because it's the grandest and the oldest Rath Yatras in Bengal, but because of the huge congregation it manages to attract. The Mahesh Rath Yatra of 1875 is of special historical significance: A young girl was lost in the fair and amongst many, the district magistrate Bankim Chandra Chattopadhya — the great Bengali poet and author of India's National song — himself went out to search for the girl. A couple of months later this incident inspired him to write the famous novel Radharani.